1. 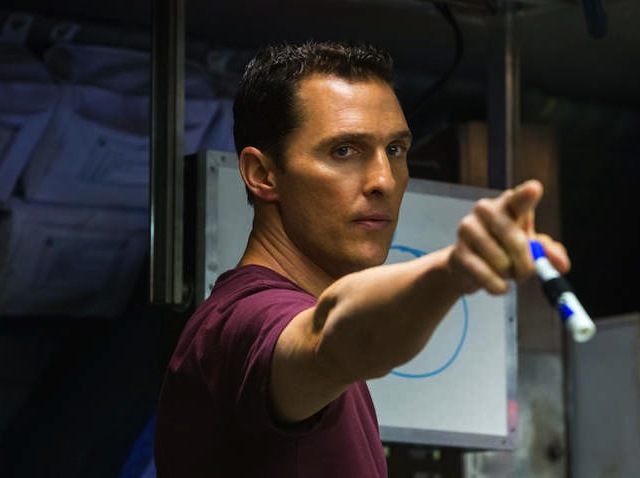 “Interstellar” Isn’t (and Is) About Religion. “Interstellar” never plays with questions about religion openly, and yet it’s the most spiritual, most mystical film in Christopher Nolan’s otherwise realism(ish)-driven body of work. The Atlantic’s Megan Garber gets into how the film implicitly deals with religious themes. “Interstellar’s” plot hinges, both intermittently and overall, on self-sacrifice, on characters willingly enduring death so that humanity as a whole might live. It hinges, even more explicitly, on the tentative promise of Cooper’s return to Earth—what you might also refer to as a second coming. It features a chosen one (Cooper’s daughter, Murph) and a chosen people: humanity as a species. There’s a ponderous shot of Cooper, about to pilot his space-colonists into a wormhole, with his eyes closed and his hands folded in what is hard not to see as prayer. Read more. To add to the spectacle, Tati filmed the entire thing in the super-sized 70mm film process that would allow him to better capture both the size and scope of what he was going for and to better represent his comment about the film being about everybody. Virtually every corner of his jumbo-sized frame is teeming with incident. By democratically refusing to focus on any one aspect, he creates a fascinating work that can literally change from viewing to viewing depending on what part of the frame one chooses to focus upon at any given time. Read more. 3. The Gerrymandering of Contemporary Cinema. Gerrymandering is one of the primary causes of Congressional gridlock, but it seems that Hollywood has caught on. Noah Gittell of Movie Mezzanine writes that Hollywood is shifting away from making broadly appealing movies and toward making films for specific demographics. Even in just the last few years, mid-range budgeted movies targeted to specific demographics are more prevalent, and they are making more money. In 2012, only three of the top 30 movies of the year were made for less than $40 million. In 2013, it was 5. This year so far, 8 of 30 were made for under $40 million, and that’s before the Oscars inflate the grosses of a few heavily-nominated smaller movies. Already, “Neighbors” (frat boys), “Ride Along” (African-Americans), “The Fault in Our Stars” (teenage girls), and “Heaven is for Real” (Christians) have succeeded without ever becoming breakout hits. Read more. 4. They Were Dead the Whole Time. “The Sixth Sense” ended with a major revelation that Bruce Willis was a ghost the whole time, but what if more movies and TV shows ended this way? Adam Sternbergh of Vulture suggests that it might actually make a number of them more enjoyable, or at least serve as a fun diversion. “Pretty Woman”: Julia Roberts is dead. She drowns in the bubble bath. Look how her head sinks under the water here, then she rises again, wearing a shroudlike mask of bubbles. Also, she’s singing “Kiss” by Prince — a clear reference to the “kiss” of death. Everything else after that point in the movie is the dying Cinderella fantasy of a bereft prostitute engaged for a week by a rich jerk who inexplicably turns into a prince. Read more. More than anyone else on the show, Milhouse represents the anxieties of a regular kid. Most kids are lucky enough not to be Martin or Ralph. Most kids aren’t angry enough to be Nelson or cool enough to be Bart. But most kids have to wear glasses, and most kids worry about their parents getting divorced, and most kids worry that even their teacher can tell nobody likes them, and most kids are afraid that if they go missing, no one will notice. Being Milhouse is the worst thing that is likely to happen to you. Read more.